Ambassador Faily explored the dynamics between Iraq’s diverse ethno-religious communities and chart the key historical developments that have impacted identity politics surrounding the nation state. Mr. Faily presented his thoughts on how to encourage social harmony between communities by working to align fundamental pillars of the Iraqi state and rebuilding civil society. In Ambassador Faily and Ambassador Khalilzad’s discussion on ethno-religious dynamics in Iraq, Ambassador Khalilzad began by outlining identity politics in Iraq, stating that identity politics were key in writing the Iraqi constitution, in which he was involved. The various identities of Iraq, Sunni, Shia, Kurdish, Yazidi, Christian, etc., have become politicized, though some predict that over time, ‘issue politics’ may replace ethnic and religiously motivated identity politics, themes which dominated after the fall of Saddam Hussein. Since then, there has been improvement in the creation of cross-sectional parties; however, when security deteriorates, people habitually revert back to ethnic ties, compromising this improvement. After this concise overview, Ambassador Khalilzad introduced Ambassador Faily, who has been able to, in some ways, transcend the aforementioned political divisions. To delve deeper into this topic, Ambassador Faily posed the question; what were the root causes of the conflict in Iraq, how do we understand them, and what can we do to influence the conflict? To answer this question, the Ambassador briefly discussed the history of Iraq, the key culture characteristics of the country, and the 2003 project involving Ambassador Khalilzad. Additionally, Ambassador Faily shared his thinking with us as we endeavor to conceive of Iraq’s ongoing transformation. The Ambassador asked us: what does harmony mean in the context of Iraq’s transformation? Finally, he shared with us a projection of the country’s future. Ambassador Faily notes that Iraq, the cradle of civilization, has seen many important human developments, giving it a “unique signature on human history. Each civilization contributed differently to the development of humans and contributed differently to the characteristics of Iraq”. Iraqi culture is thus a myriad of characteristics drawn from the various cultures it has hosted. Current social narratives draw from this plethora of influences. Unlike the United States, the nation and the state of Iraq were not created at the same time; the process of state-creation lasted nearly 100 years in the period following World War I. Ambassador Faily added that Iraq’s oil reserves are critical when thinking about the position and future of the nation. A member of OPEC, Iraq’s oil reserves are some of the most extensive. Geographically, Iraq is strategically positioned between Iran and Turkey; in that sense, it acts as a sort of “Arab frontline” regionally. Historically, Iraq was the Abbasid center of Islam, a role that increases its geographical and historical importance. Further adding to the complexity described, the Ambassador notes, is Iraq’s history of outside rule. From 800 years ago to the republic in 1958, the country was lead by leaders of outside powers. Ambassador Faily further expanded on Iraq’s culture by describing to us the relationship between the nation, the state, and the rule of law. The concepts of ‘nation’ and ‘state’ in Iraq have different connotations. In the US, the primary social contract narrative is that of the rule of law; however, due to the previously mentioned myriad of cultural influences that make up the much older nation of Iraq, rule of law in Iraq often considers the differences between government, cultural, tribal, and religious narratives on law. In addition to these various facets, the ambassador points out that the social fabric in Iraq, like other Arab Spring countries, is weaker when dictatorial repression is in place. A social contract in which citizens and the government have a mutual understanding is “in evolution” in Iraq. Given this knowledge, Ambassador Faily asks: “Can democracy be customized? How can a nation be democratic in its system if its parties are not internally democratic?” Democracy, the Ambassador asserts, is comprised both of a legal structure and a public social understanding. The Ambassador points out that individuals in the Middle East often do not experience democracy in their daily lives; despite this, since 2003, there has been a willingness by religious establishments and other sectors of society to promote democracy in the form of voting. However, voting is only a piece of democracy. Since 2003 and the formulation of the second republic of Iraq, developments have moved towards separation of powers and representation of different sectors of society based on American ideas. Unfortunately, western sanctions on the country throughout that period only managed to evaporate the middle class. The United States, asserts Faily, did not correctly manage the cultural and historical complexity of the country in their push for democracy. Towards the end of Rumi Forum’s discussion with Ambassador Faily and Ambassador Khalilzad, Ambassador Faily stressed that the main question regards which parts of society should be drawn out to promote democracy and change. The rapid, decade-long transformation that has occurred in Iraq, complicated by the nation’s view of and relationship with the United States, must be supported by social harmony, which can only occur when different sectors of the country come together to compliment each other’s skills and resources. Ambassador Faily emphasizes that there must be enough social cohesion to ensure that the government reflects the wishes and desires of its people, fulfills their needs and not merely their desires, and provides the environment for those goals to be implemented. Iraq’s transformation, he concludes, is ultimately in the hands of Iraqis, who should draw on their neighbors and the international community to support their transformation. Ambassador Lukman Faily serves as Iraq’s Ambassador to the United States, a position he has held since July 2013. From June 2010 until May 2013, Mr. Faily served as Iraq’s Ambassador to Japan. Prior to joining the diplomatic corps, Ambassador Faily lived in the United Kingdom for 20 years, working in the Information Technology sector for several transnational companies. During his last ten years in the UK, he held senior management positions in two major American companies. Mr. Faily was an active leader within the large Iraqi exile community in the UK and served as a trustee for several non-governmental Iraqi organizations. He also played an active role in opposing Saddam’s dictatorship and advocated for democracy and rule of law in Iraq. He is fluent in English,Arabic and Kurdish. Ambassador Zalmay Khalilzad (moderator) served as U.S. Permanent Representative to the United Nations from 2007 to 2009. Prior to that, he served as U.S. Ambassador to Iraq (2005-2007) and U.S. ambassador to Afghanistan (2003 to 2005). He also served as U.S. Special Presidential Envoy to Afghanistan (2001 to 2003). Amb. 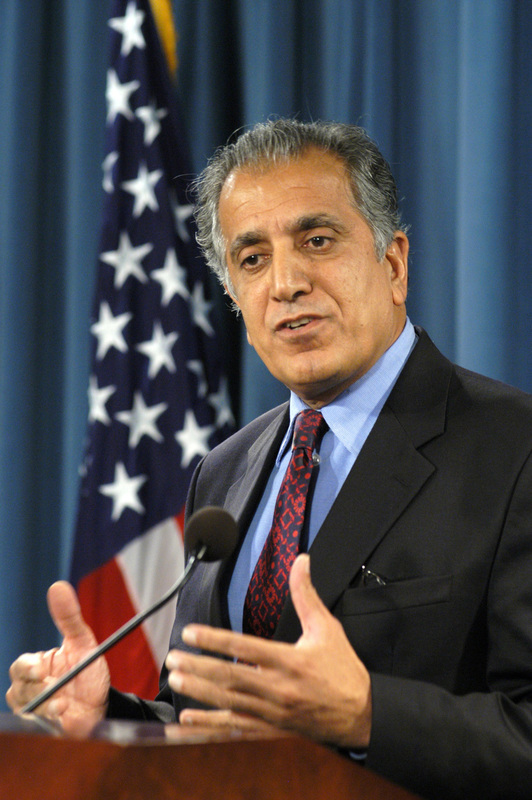 Khalilzad sits on the boards of the National Endowment for Democracy, America Abroad Media, the RAND Corporation’s Middle East Studies Center, the American University of Iraq in Suleymania, and the American University of Afghanistan. He is also a counselor at the Center for Strategic and International Studies.